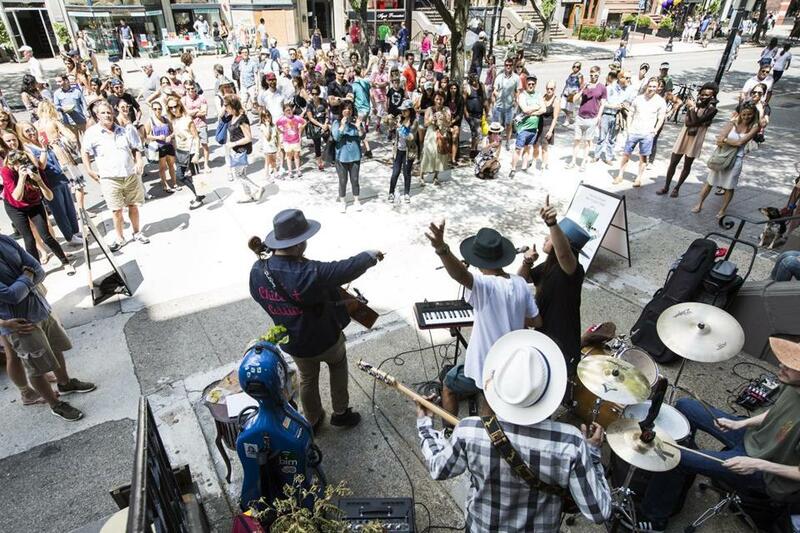 The band Shah from the Berklee School of Music played for crowds along Newbury Street in August. Would you like a little guitar with that? The Boston City Council is expected to vote Wednesday on a new program that would allow storeowners to host modest acoustic acts without first getting a license, an effort officials say would entertain patrons as they shop or nosh — and boost foot traffic in business districts. The “Boston Unplugged” ordinance, filed by Council President Michelle Wu, would strip away the cumbersome process and costly fees small businesses face when trying to secure a live performance license for such shows. If passed, storeowners in business districts citywide could host up to five entertainers or musicians at one time, so long as the acts are acoustic. Artists would be able to use a single microphone. Performers could take the stage between the hours of 10 a.m. and 10 p.m. Food or drink could not be served at a business hosting a show unless it’s a licensed bar or restaurant. Under the new rules, Wu envisions musicians strumming guitars at grocery stores, or filling the air with melodies at restaurants during brunches. “I think restaurants will see the value in it … And that other businesses will as well,” she said. A hearing on the plan was held Monday. The ordinance will go before the full council at Wednesday’s meeting. The ordinance was crafted in collaboration with Mayor Martin J. Walsh’s office. Wu said the mayor fully supports the concept. The proposal was inspired by the city’s successful “Acoustic on Main” program, a 10-day event launched in May 2015, in conjunction with National Small Business Week. Two more similar programs were allowed in the city’s Main Street Districts in August and December that year. Wu’s ordinance would have a sunset provision of one year, at which point the City Council could evaluate how well it worked. But she thinks the idea will be embraced.